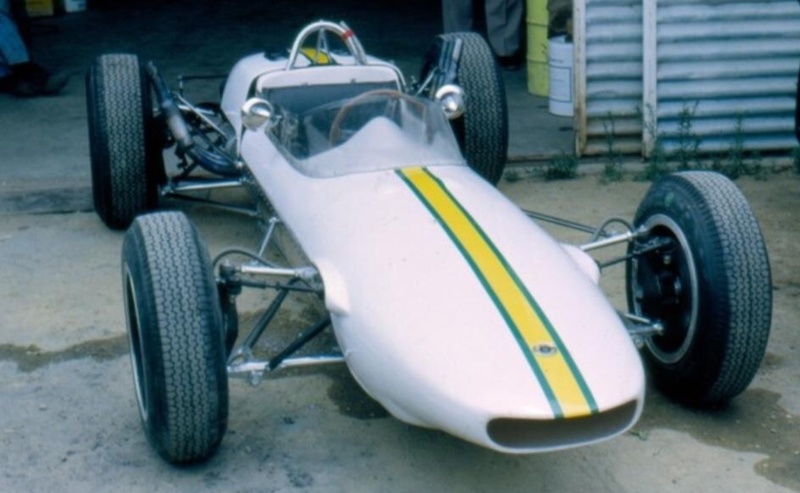 Yet the Elfin Clisby, as it is called, is potentially Australia’s first internationally competitive Formula One racing car. Virtually every part of it has been built in Australia, by Australians with remarkably few resources. 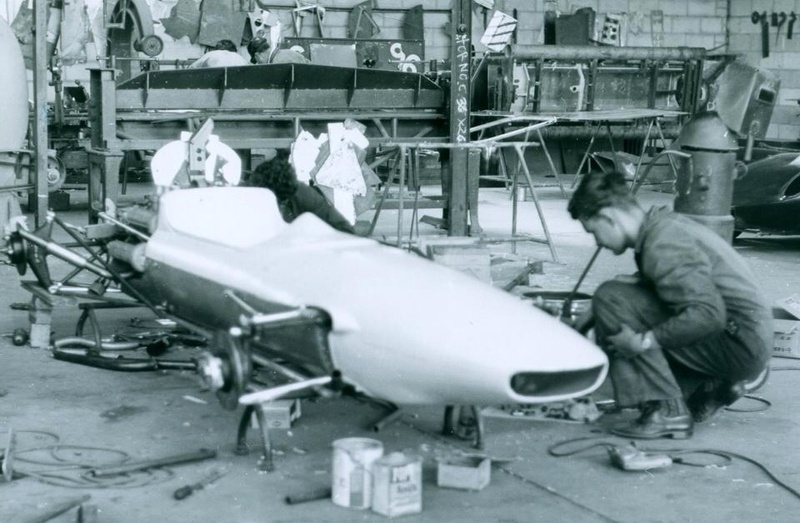 The chassis is basically Elfin Monocoque, (Elfin T100 or more colloquially and commonly referred to as the ‘Elfin Mono’) the latest design by Garrie Cooper of Elfin Sports Cars, at Edwardstown South Australia’. 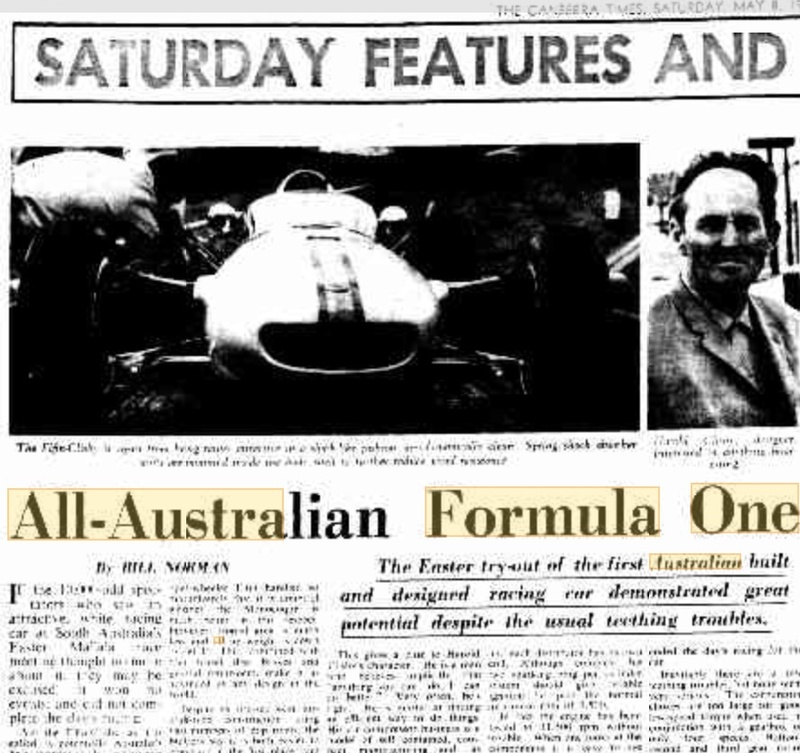 I’ve hit gold, in my own mind anyway- I’ve found a first hand account of the Elfin T100 Clisby V6 race debut at Mallala, South Australia over the Easter weekend in 1965. It was written by ‘The Canberra Times’ journalist Bill Norman and published on Saturday 8 May, here it is in all of its contemporary glory untouched by me. The photo choices are mine though as the newspaper photo reproduction ain’t flash at all, as are the captions except one which is attributed to Bill. 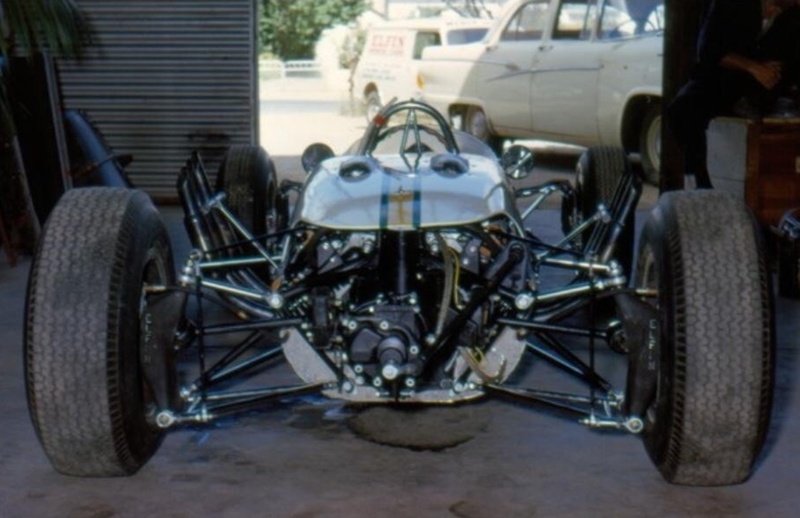 ‘The previous spaceframe open-wheeler (the FJ/Catalina) handled so magnificently that it is doubtful whether the Monocoque is much better in this respect. However, frontal area is much less, and all up weight is down by 60 lb. This, combined with four-wheel disc brakes (which most variants of the Catalina had) and general refinement, make it as advanced a design as anywhere in the world. 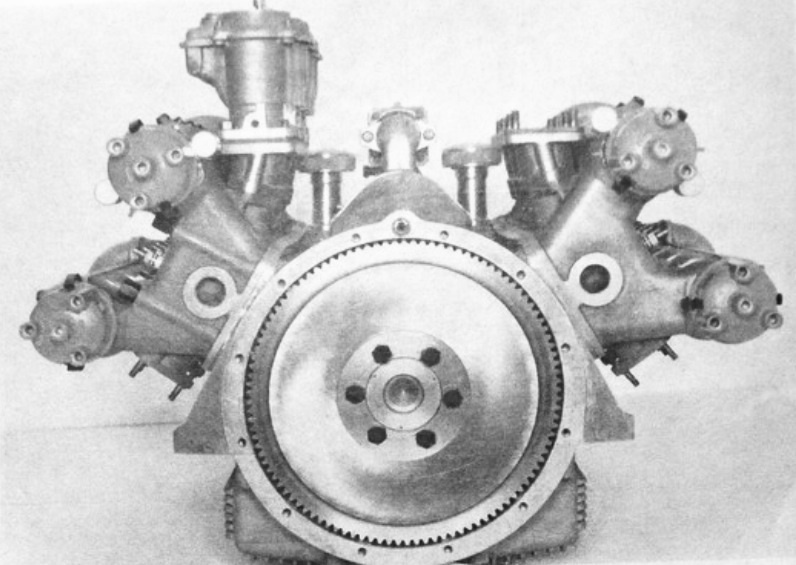 ‘But the Clisby engine is the heart of the car, and the most interesting part of it. This is because no Australian has previously been ambitious enough to attempt to build a Formula 1 racing engine right from scratch. This gives a clue to Harold Clisby’s character. He is a man who believes implicitly that “anything you can do i can do better”. Very often he is right. He is a master at finding an efficient way of doing things. His air-compressor business is a model of self-contained, compact manufacturing and as well as marketing air-compressors in Australia, he has built up a growing export market. 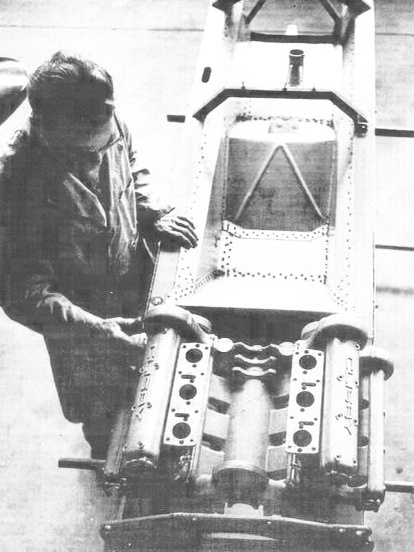 ‘The sting to its tail…Mr Harold Clisby’s unique V6 engine is mated to a Volkswagen gearbox and differential. This photo was taken immediately after the first try out at Mallala when vibration shattered all four distributor caps and broke an exhaust bracket. The problem is now cured’ (Bill Norman words) In fact the photo is not at Mallala but outside Elfins- i’ve used his caption for this photo which is almost identical to a monochrome shot used in the article referred to above which will not reproduce in any way adequately. ‘His engine would take an entire article to describe in detail and i won’t attempt to do so. 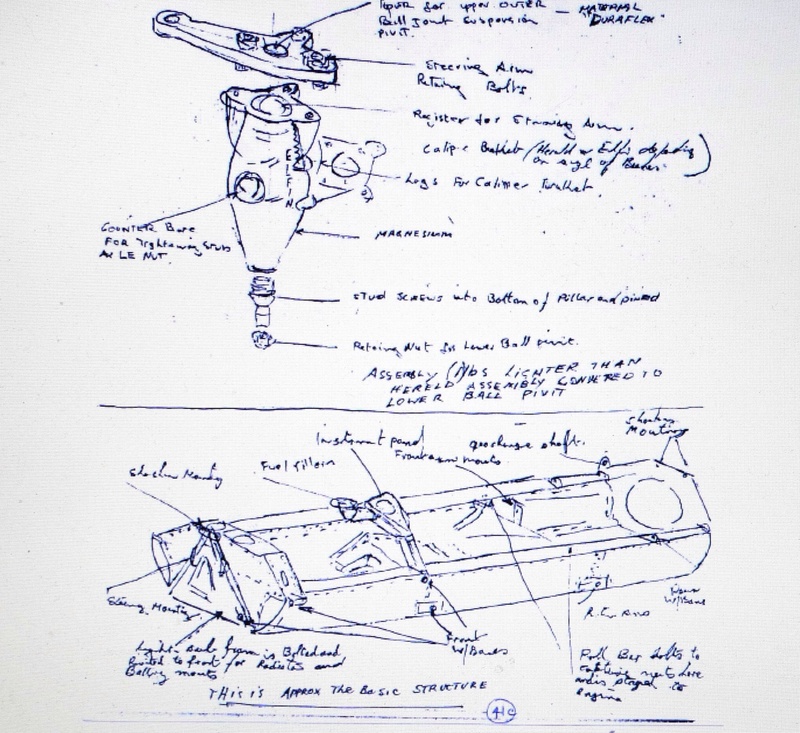 The important thing to remember is that Clisby designed and buily every part except the electrical sysytem, in his small factory. Aluminium alloy castings, nitrided steel crankshaft machined from a solid billet, 120 ton vibrac conrods: the lot. 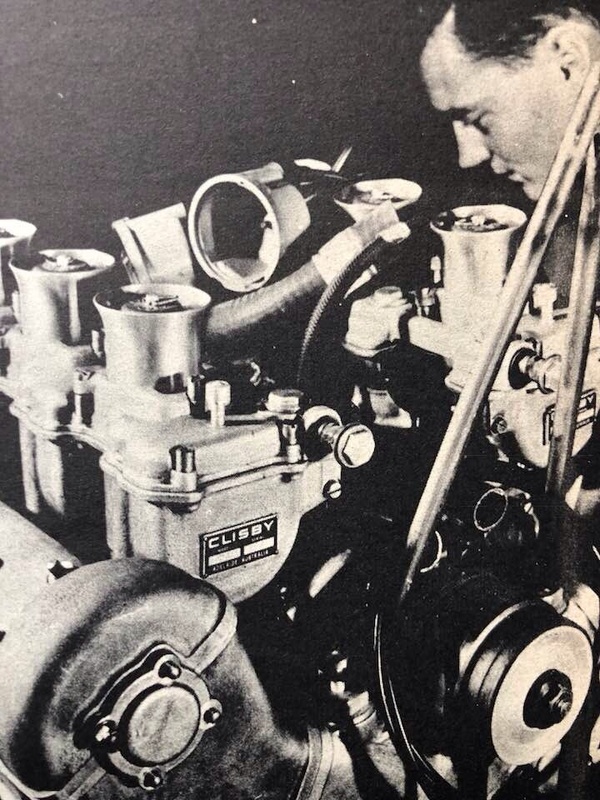 He even built the two triple-choke carburettors- a tremendous task on their own. Basic engine configuration is a 1.5 litre V6 with a bore of 78mm and stroke of 58.8. 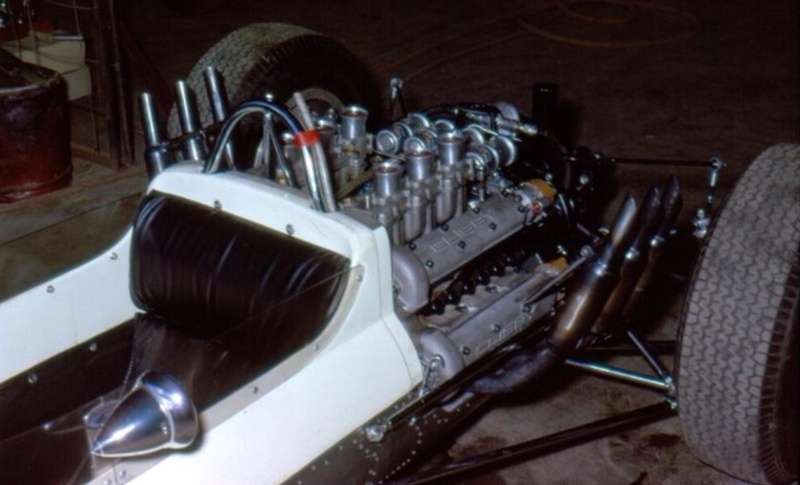 Cylinder banks are set at an angle of 120 degrees, using duel overhead camshafts for each bank and hemispherical combustion chambers. Each camshaft drives its own distributor, and each distributor has its own coil. Although complex, his two spark system should give reliable ignition far past the normal maximum rpm of 9,500. ‘Lubrication is by dry sump, using 80 psi pressure. With this system, a primary pump provides oil pressure for the bearings, while a large scavenge pump keeps the sump empty of oil and passes it to the oil tank in the nose. It combats oil surge positively and makes it simple to cool the oil properly. Dynamometer tested recently, the engine gave 165 bhp on a compression ratio of 9:1. Since this, the ratio has been raised and power should be now closer to 180 bhp. Assuming further developments to bring this figure to 190 horsepower, and considering the car’s much lighter weight, South Australia may soon have a Climax eater. 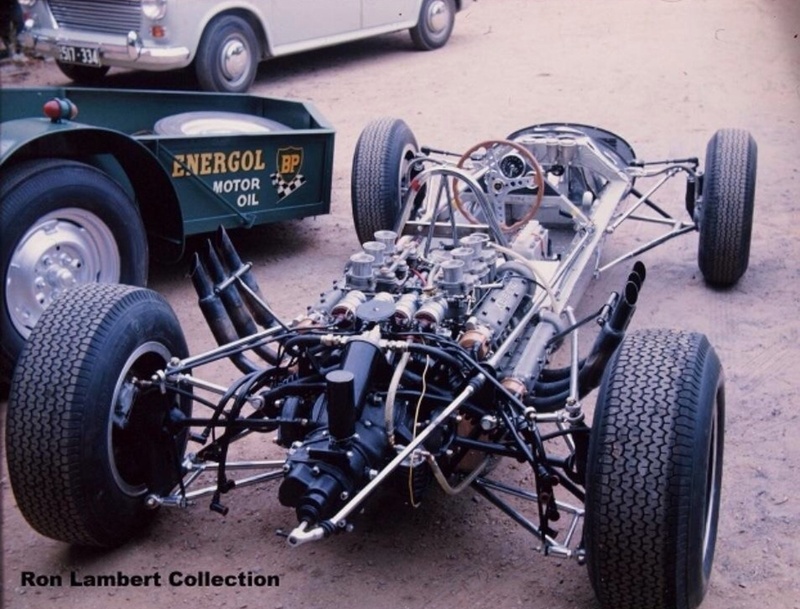 A modified Volkswagen gearbox differential unit is direct coupled to the motor, and power is transmitted through rubber universals and Hillman Imp halfshafts to the rear wheels. The Easter Monday racing debut of the Elfin Clisby was promising in some ways and disappointing in others. 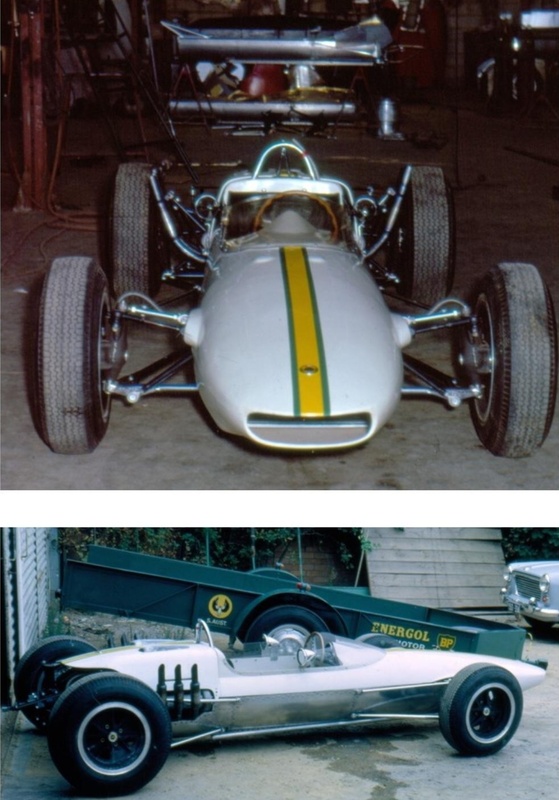 When well known driver Andrew Brown drove it in the first scratch race, two things were at once obvious. Firstly the engine had a a bad carburetion ‘flat spot’ in low to medium range, and secondly, the tremendous acceleration once this point was passed. No one who saw the car apparently getting wheelspin in third gear really doubts that sufficient ‘urge’ is there. A healthy bark came from its two 2.5 inch exhausts and acceleration in each gear seemed almost instantaneous once the ‘flat spot’ was passed. In his first race, Brown drove to a creditable fifth place against some very hard driven machinery. 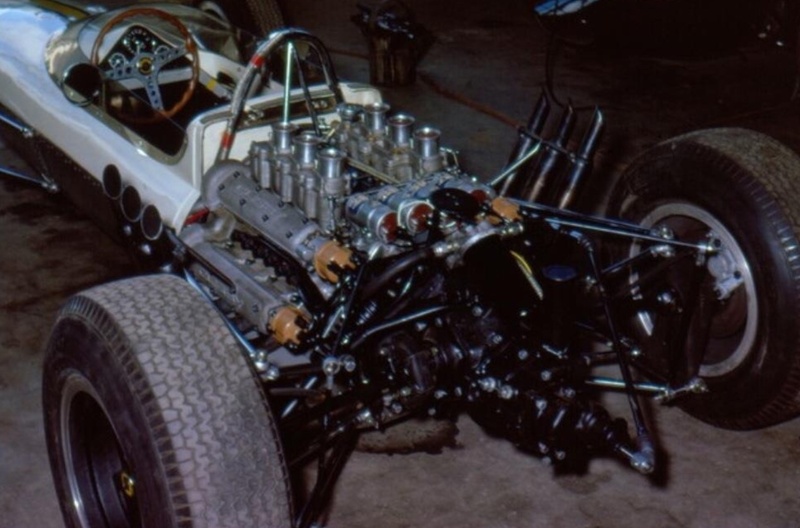 This despite a self-imposed rev limit of 8,000- well below maximum power at 9,500- and relatively slow acceleration away from the corners due to carburetion troubles. A rear tyre blew out in lap one of the second race, and the Elfin Clisby ‘went bush’ in a cloud of dust. 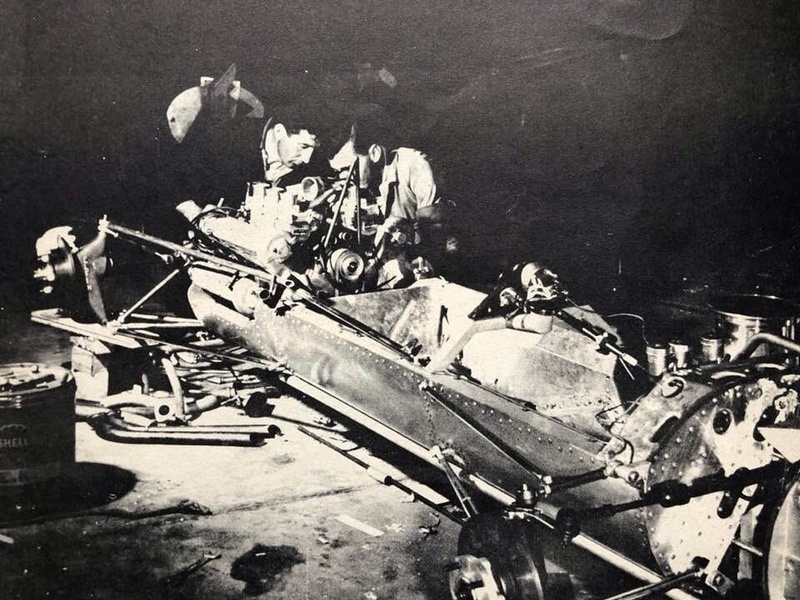 The suspension sustained some damage and ended the days racing for the car. Inevitably there are a few teething troubles, but none seem very serious. The carburettor chokes are too large for good low speed torque when used in conjunction with a gearbox of only four speeds. Bottom, second and third gear ratios were not suited to the circuit, which magnified the first problem. High frequency vibration- always troublesome in a V6 engine- was a difficulty at first but now has been all but cured.